GE Healthcare will exit the health IT market by selling its revenue cycle, ambulatory care, and workforce management software business to Veritas Capital for $1.05 billion in cash. Veritas Capital’s previous health IT acquisitions include Verisk Health (2016, renamed to Verscend) and the healthcare unit of Thomson Reuters (2012, sold to IBM for double its acquisition price in 2016). From Penultimate: “Re: EMRs as a research database. I looked at the article you linked to in your tweet about conglomerate vendors. That took me to the one where you predicted that EMRs linked to genomic data and social determinants of health would give drug companies valuable information they would be willing to pay for.” I forgot about that piece from 2006, in which I said, “Drug companies and device manufacturers need the data that lives in your clinical systems. How else will they be available to target research to a very narrow range of patient types, maybe even those with a rare genomic profile? It could help them identify appropriate research subjects, design post-marketing surveillance, study population-based outcomes, and catalog adverse events. The information you provide could either be de-identified or made available only if individual patients opt in. The benefit to patients is access to a wider variety of treatments and protocols, most likely free to them if tied to a research project.” Your inquiry led me to look at the other editorials I wrote long enough ago that I can enjoy them as something new. Welcome to new HIStalk Platinum Sponsor Qventus. 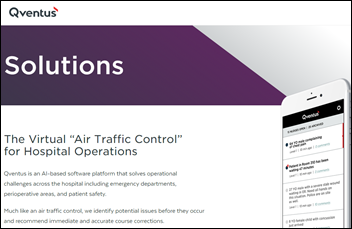 The Los Altos, CA-based company’s AI-powered technology – which serves as virtual air traffic control for hospital operations — helps healthcare teams turn data into action and action into results. Its real-time decision management platform improves efficiency, patient experience, and clinician satisfaction by predicting issues, recommending immediate actions, alerting the right team members, and coordinating response. 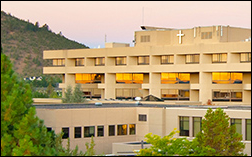 Success stories include El Camino Hospital (reduced falls by 39 percent), Stanford Children’s Health (increased patient satisfaction by 18 percent), Mercy Hospital Ardmore (reduced patients who left the ED without being seen by 55 percent), and Mercy Hospital Fort Smith (reduced unnecessary lab tests by 40 percent). Hospitals have rolled out countless dashboards and analytics reports from competing companies without success because those on the front line still have to make operational decisions with incomplete insight. The company’s platform is quickly deployed, easy to use, and easy to integrate with EHRs. Check out your own hospital’s efficiency ranking. Thanks to Qventus for supporting HIStalk. Here’s a Qventus intro video I found on YouTube. Listening (and watching): “Long Time Running,” an outstanding documentary streaming on Netflix that covers the bittersweet 2016 farewell tour of Canadian rock band The Tragically Hip after singer-songwriter Gord Downie was diagnosed with terminal brain cancer (he died a year later). The super-talented group has been intact since 1986 and the members agreed early on to share all songwriting credits (a la the Doors) to avoid dissent. The band’s love of country and affinity with their fellow Canadians (including Prime Minister Justin Trudeau, who appeared in the film) was a joy to watch, albeit with envy. I had a routine appointment with a specialist today and saw the usual pointless form entry repetition first hand. They copied my insurance card, but I still had to manually write the information down on their paper form. Same with my referring doctor’s information. Every form asked me again for name, date of birth, age, and current date (apparently nobody was able to subtract B from D to calculate my C). Form fields weren’t big enough for the information requested. I had to sign in on the clipboard upon arrival, and of course I could see every person’s name and doctor. Then after filling everything out – medical history, family history, meds, social habits, etc. – the MA in the exam room asked me the same questions all over again so she could enter it into the EHR. However, healthcare is so defiantly and illogically inefficient that this process seemed streamlined and sensible in comparison. April 5 (Thursday) 1:00 ET. “Succeeding in Value-Based Care Via a Technology-Driven Approach.” Sponsor: Health Fidelity. Presenters: Adele L. Towers, MD, MPH, senior clinical advisor, UPMC Enterprises; Adam Gronsky, director of advisory services, Health Fidelity. Success in value-based care requires a thorough understanding of how risk-based payment models work. To prosper in this data-laden era of care, providers need to manage their patient populateeions holistically rather than through a collection of individual episodes and be able to accurately identify, document, and report risk scores. Given the stakes, is your provider organization adequately set up to take on and succeed in managing risk? In this webinar, learn how technology-enabled risk capture optimization is helping providers succeed in risk-based payment models. Orion Health Group announces poor annual results and implementation of a cost-saving restructuring as it reorganizes into three business units – Rhapsody, population health, and hospitals. Share price hit an all-time low on the New Zealand stock Exchange following the financial report, reducing the company’s market cap to $100 million. 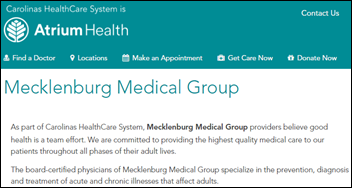 Ninety-two of the 104 doctors of Charlotte, NC-based Mecklenburg Medical Group sue Atrium Health (the former Carolinas Healthcare System) to leave the health system and operate independently following contract changes that reduced the practice’s RN staffing levels, centralized triage and reception functions at a call center, reduced compensation, and added a non-complete clause that prevents doctors from practicing with a 30-mile radius for a year after leaving. Humana, MultiPlan, Quest, Optum, and UnitedHealthcare launch a pilot of a blockchain-powered project to improve provider directories. 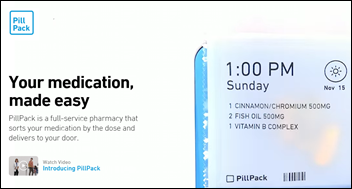 Walmart is rumored to be in acquisition talks with PillPack, an online pharmacy that packages individual doses into reminder packs. The rumored price is in the $1 billion range. The Nashville paper confirms an item a reader submitted a few days ago – Microsoft is suing Community Health Systems for breaching its software licensing contracts. Hyland completes its acquisition of Allscripts OneContent (the former McKesson Horizon Patient Folders), transitioning its Alpharetta-based employees and 350 customers. Illinois Rural Community Care Organization chooses Cerner HealthIntent for population health management. Physicians’ Clinic of Iowa chooses the cloud-based EClinicalWorks v11 for its 84 providers. McLeod Health (SC) promotes Matt Reich to SVP/CIO. PatientPay hires Vikram Natarajan (Medfusion) as CTO. Connected health technology vendor ResMed hires Bobby Ghoshal (Brightree, owned by ResMed) as CTO. Susan Pouzar (Harris Healthcare) joins Genesis Automation Healthcare as VP of sales. Neal Schwartz (Cerner) joins MedeAnalytics as COO. ROI Healthcare Solutions launches a staffing and recruitment outsourcing organization called ROI Resource Group. St. Charles Health System (OR) will go live on its $80 million Epic system next week, less than a year after choosing the company’s products. 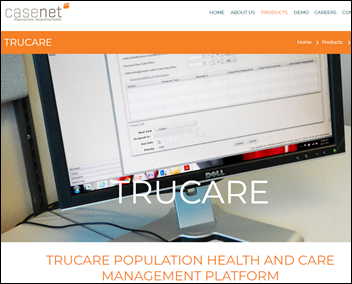 Population health management solutions vendor Casenet releases its TruCare Opioid Toolkit, which provides a patient assessment, an evidence-based care plan, and education materials. President Trump’s proposed CMS operating budget would eliminate funding for insurance exchanges. Politico notes that the State Department has issued an RFP for a new EHR. It was previously collaborating with the Coast Guard to implement Epic until that project failed. The State Department is specifically interested in how an EHR would provide shared services opportunities with the DoD and VA, which would seem to point to Cerner as the most likely choice among the few capable vendors. Kentucky passes a law prohibiting federally certified radiologists from interpreting X-rays in black lung compensation claims, allowing only pulmonologists to make those assessments. Of Kentucky’s six certified pulmonologists, four work for coal companies or their insurers. Cloudflare launches 1.1.1.1, a brilliantly named DNS service that improves network performance and privacy (and maybe gain access to geo-blocked content, if that’s your thing). I’ve used DNS proxies before and they work fine, so I took a couple of minutes to set this one. It’s working invisibly, which is exactly what you would expect. A Harvard Business Review article says the US spends too much of its healthcare dollar on low-value services that offer minimal clinical benefit, blaming: (a) limited effectiveness data for everything except drugs; (b) doctors make money from performing low-value services that they often can order themselves with payments protected by lobbyists; (c) patients lack the information to make their own decisions or to hold their doctors accountable. It notes that some high-value therapies are underused strictly because they are expensive, such as gene therapy and hepatitis C treatments. The authors propose using the capital markets to give insurers compensation when a patient’s early, expensive treatment results in savings for another insurer (like Medicare) down the road. Medecision launches Aerial CarePlanner 360 that supports person-centric care. Meditech publishes a video in which hospital customers describe how they benefit from using Meditech. HCS will exhibit at and sponsor the NALTH Sprint Clinical Education & Annual Meeting in New Orleans on April 5-6. Bernoulli Health will exhibit at SWUGM 2018 April 6 in Phoenix. CompuGroup Medical will exhibit at the ACMG Annual Meeting April 11-14 in Charlotte, NC. Everest Group recognizes Conduent as a leader in healthcare business process outsourcing. Your first article, with the sentence: “GE Healthcare joins previous healthcare IT acquisition-fueled dabblers (McKesson, Siemens, Misys, Sage)” is just redux of a 15-20 year cycle that both you and I have seen, based on our common acquaintances in HIT. I was around to witness Baxter Travenol merging with American Hospital Supply in the late 1980s and going on an IT buying binge (Dynamic Control, JS Data, others). Reason given was that while selling IV solutions and tongue depressors was highly profitable, each point of additional market share cost them mega-millions. So they thought they could get into HIT and make quick margins. What this meant was the physician practice management system (this was pre-EMR days) I worked for suddenly was being run by execs and their herd who had been successful in selling surgical instruments and found themselves telling an experienced software sales team how to sell into a market where the new leadership had no experience. Quite the hoot, but sad. Baxter’s goal was to have 10 pct of their company (the HIT) product 90% of revenue growth. Results, lots of money spent, finally resulting in the spinoff to IBAX, later Spectrum (I may have that backwards). History repeats itself, if only we would look back. I guess we need to wait 15 more years to see the cycle repeat, once new blood is in the drivers seat of a major company and thinks they have found a solution to their revenue woes. After all, if we can run a manufacturing company, why can’t we be successful in healthcare?? Historical trivia, if I’m remembering correctly: it was Dynamic Control, then Travenol Health Information Solutions, then Baxter Systems Division, then Spectrum Healthcare Solutions (until the ED staffing group Spectrum sued over the name), then the Baxter-IBM JV spinoff IBAX Healthcare Systems. Then the unprofitable mess was sold to HBOC in 1994 for an unimpressive $44 million. Once the founders walked away, the clown car full of clueless corporate management ensured failure. You are right that every time a non-health IT company tries to apply its “system” to an acquired company, it messes up whatever was good about that company in the first place. You could count on every GE Healthcare acquisition going from first to worst in KLAS under its umbrella. Q: What do you get when GE acquires your sassy, innovative health IT company? A: GE. My theory is that much of the problem is that those big companies are used to grooming executives by moving them around and putting them in charge of a vertical they know nothing about, so companies like GE loved the idea of moving some suit from nuclear power plants to its entertainment division. That hasn’t worked out well. I bet the corporate backstabbing was intense. Misys was the biggest train wreck in my opinion. Putting British banking software people in charge of a US healthcare division was a disaster for everyone involved, both for Misys and for the eerily similar Sage. You would not have to look very far to find some very large healthcare IT vendors being run by teams of middle-aged white men with zero software experience who all come together from company ‘XYZ’ with ‘light’ healthcare delivery experience. IV bag and alcohol swab logistics are very important and while they are in fact delivered, they are definitely not healthcare delivery. Regarding Penultimate’s comment and Mr. H’s editorial on the use of EMRs with genomic data: I have to think that the big IDNs like Kaiser Permanente that use EPIC and offer genomic testing to certain sectors of their patient population will be doing big things with data mining as more and more people in their populations have their genomes sequenced. If they could get to the point where they had 2 million people with genomic records married with multi-year structured data like what gets captured in EPIC it might be possible to discern some interesting patterns. If you add in the possibility of analyzing the gut biome too, I have to think that we’ll be seeing an acceleration in discoveries and an improvement in targeting therapies – true personalized medicine. Epic is not an acronym. A favourite memory: Attending a Tragically Hip concert. It was outdoors, late summer as I recall. The stage faced the setting sun and of course sundown takes a long time in the north. Perfect weather, with everything glowing orange and warm from the light. Singing along with Ahead By A Century, Bobcaygeon, and New Orleans Is Sinking. It doesn’t get much better than that.